This charming nature inspired floor lamp features a pine cone Mission designed shade with Bark Brown granite glass. The Pine Cone Mission Floor Lamp has pine cones on a Clear granite glass background with pine needle detailing. 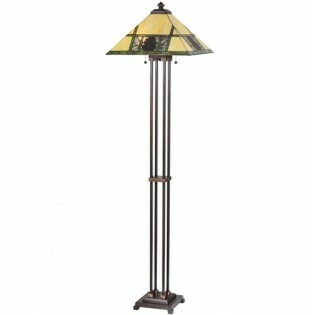 This charming nature inspired floor lamp features a pine cone Mission designed shade with Bark Brown granite glass. The Pine Cone Mission Floor Lamp has pine cones on a Clear granite glass background with pine needle detailing. Bone Beige stained glass is geometrically divided by Moss Green bands on the shade. An exquisite Mission style floor base is hand finished in Mahogany Bronze.